Seven Card Stud is one of the most renowned variants of poker, and before Texas Hold‘em it was also one of the most popular. 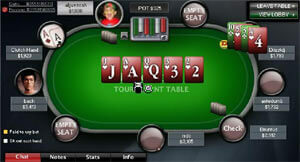 It still remains a very popular poker game and you can enjoy player this card game in land based poker rooms or online. If you are keen to play a challenging game of HORSE, then it is very important that you understand Seven Card Stud as it is one of the rounds. Once players have paid the ante the first round begins. All players are dealt three cards; two are faced down one card is dealt faced up only the player can see the faced down cards. The player with the lowest nominal and suited faced up card gets the ‘bring in’ bet and must therefore bet desired amount first. Play then continues clockwise around the table until all players have acted. In the next three rounds a fourth, fifth and sixth card is dealt faced down to each player with a round of betting in between. In these rounds, it is the player with the highest showing card who will begin the betting. The seventh card, also known as the River Card, is the final card to be dealt. This card is dealt faced up and a round of betting takes place which is initiated by the player with the highest value showing cards. Once the betting has ceased the remaining players must show their cards to see who has won. Although you are dealt 7 cards, a winning hand can only be made from 5 of the cards. There are many different hands that can be made in order to win a game of Seven Card Stud, but there are certain hands that are much better than others. Royal Flush – this hand consists of 10, J, Q, K, A, and all the same suite. Straight Flush – this hand must have 5 cards, all of the same suit and in order, such as 5, 6, 7, 8, 9. Four of a Kind – this hand is simple; you need four cards the same plus one other, such as 7, 7, 7, 7, 9. Full House – this hand is made from three of a kind plus a pair, such as K, K, K, 9, 9. Flush – this hand requires all of the cards to be the same suit, but not in order, such as 3, 5, 9, J, K.
Straight – this hand is made up of 5 cards in row, but they don’t have to be the same suit, such as 2, 3, 4, 5, 6. High Card – possibly the worst hand, but you could still win if no one has any of the above hands and you have the highest value card.